Well known for his especially physical play and somewhat volatile temper, Ron Hextall is arguably one of the best puck handlers the NHL has ever witnessed, with his mobility and skating prowess second only to Martin Brodeur. We have a signed stick used by the Brandon Manitoba native during his heyday with the Philadelphia Flyers in the mid-to-late-1980s. 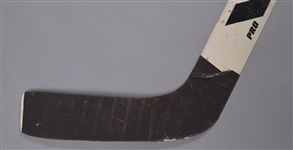 A Victoriaville Pro model with “R Hextall” stamped-on, the stick retains the original black tape over the blade and white-over-black on the knob, with the striping accent present over the handle. Thorough use is exhibited, with wear to the underside of the blade along with a few marks to the paddle. There is also some heavy red paint transfer over the upper shaft and blade, with this occurring from Hextall’s trademark of hitting the goal posts repeatedly in a back and forth pattern. With a nice black marker signature added over the paddle, this is one of the better Hextall sticks you’ll find regarding both use and player attributes.